Jeff Stone, President of Madison, Wisconsin-based Kelly-Moss Road and Race, is well known around the IMSA paddock for his talent for developing young drivers into champions. Stone and his Kelly-Moss team nabbed championships in both the IMSA Prototype Challenge Presented by Mazda and the IMSA Porsche GT3 Cup Challenge USA by Yokohama series this year. In fact, Stone has won three out of the last four GT3 Cup Challenge USA championships since 2014. “It’s not about having the fastest driver – it’s about having the right driver,” Stone said. “I often tell the parents of young drivers, ‘When you sign up with us, you sort of lose parental rights.’ We can’t have soccer parents hovering around their kids and they have to learn how to be adults. We try to help them grow into adults and work with sponsors and the press and represent themselves as Porsche and as Kelly-Moss would want them to be represented. 2017 GT3 Cup Challenge USA champion and Hurley Haywood Scholarship winner Jake Eidson met Stone in 2016 when he gave the young driver a shot at Road America in a Kelly-Moss entry. Kelly-Moss driver Colin Thompson, who won a Porsche GT3 Cup Challenge USA championship in 2014, made the move from a Porsche 911 GT3 Cup car to a Norma M30 in the Prototype Challenge series this year. After winning the Porsche GT3 Cup Challenge USA championship, Thompson moved to another sports car series in 2015 before returning to IMSA to try his hand at driving the Norma LMP3 car. 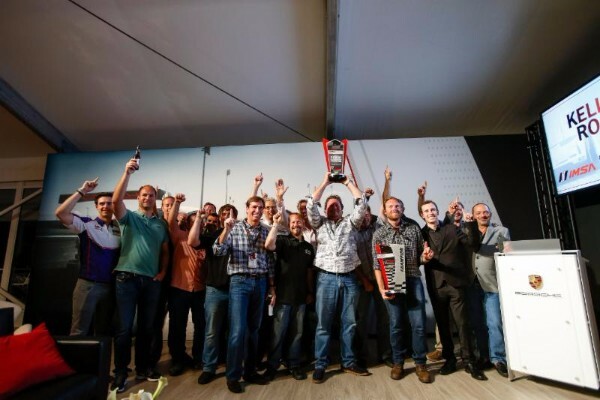 Thompson won the Prototype Challenge championship this year by a narrow points margin of 217-209 over 2015 Prototype Lites champion Kenton Koch. “All of the young drivers I’ve worked with help create a rabbit to chase for the Masters class guys, and it helps to have that data sharing back and forth,” Stone said “It’s a good experience for everyone all the way around. Stone said it’s also important to spend personal time together as a team – away from the track – to develop a bond and trust amongst each other. Stone, a former engineer, won 14 out of 14 races in the GT3 Cup Challenge USA in the Gold class in 2008, which set a record for the most consecutive road racing wins with Tony Rivera winning 12 races and Ross Smith winning the other two. “It’s a whole different level of completion now,” Stone said. “It’s an ever-increasing theme in motorsports that everything gets more complicated and costly each year, but we have a good pattern of consistency with our team. “We’re looking forward to next season. We have a lot of great guys – both seasoned and new. Anytime you have a freshman driver, usually it’s difficult. I’m really excited when guys push through and it’s really rewarding – everyone sees the build up to that point of why they did it and spent all this time on it.